It’s Fun To Feed The Cat! 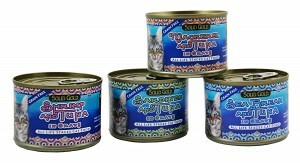 Four new seafood and gravy varieties of canned cat food is expected in November 2012 from Solid Gold Health Products for Pets, Inc. These new formulas are grain-free and formulated for all stages of life. Solid Gold specializes in the development of “non-allergenic” pet products, which work together to enhance total health, boost up the immune system and protect against disease. Solid Gold offers the most complete line of holistic pet food, including grain and grain-free dry cat food and canned food for cats. DNA will launch their cat food line with five exciting formulas in Novemeber 2012. All formulas from DNA are grain-free and formulated for all stages of life. DNA cat foods are 80% meat, 10% egg, 8% fruits & veggies and 2% added oils. D.N.A. is both the ultimate filler free dry food, and an environmentally friendly wet food when rehydrated back to its meaty form. Dried-N-Alive is a new breed of dry pet food based on holistic canned food recipes, but without the costly aluminum can and expensive to ship water. DNA Pet Food the world’s first filler-free dry pet food made from canned food recipes. Dried-N-Alive Cat Food is gently dried at low temperatures; the result is dried, nutritionally alive pet food. Coming soon (December 2012)! Kitty Cups and Cat Toppers. 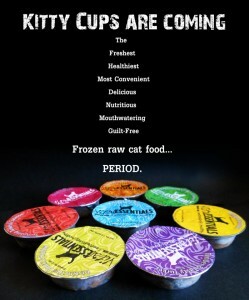 Kitty Cups ( 1 cup = 1 Meal = 1 Cat) are frozen raw food diets and Toppers are freeze-dried raw nibblets. Vital Essentials Raw brings us the “Alpha Prey Model Diet” which is made from real meat, meaty bones, and whole organ meat that naturally provide the vital balance of nutrients pets need to thrive. Complete raw and freeze-dried diets for dogs and cats; all diets are grain-free and meats are hormone and antibiotic- free. Vital Essentials is leading the way in raw pet nutrition and is proud to be one of only a few pet food companies in the world who are USDA certified.